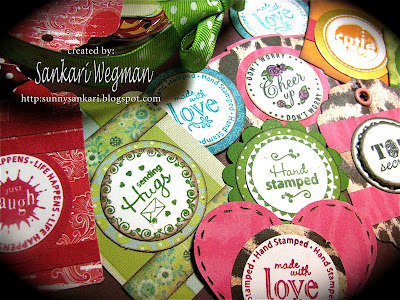 Wow Sankari you rocked these stamps adorable work as always I especially love those tags, great idea. OMGosh these are incredible!!! What a wonderful assortment of eye candy!!! WOW! All great projects. LOVE that memory box. How pretty is that?? WOW - Love the font on the box!!!! I really like what you did with the memory box. Neat projects! Love the colors in the box! Card is beautiful too ! I just love these ideas!!! They are all so creative and unique! Your box is incredible and I know your friends daughter will treasure it always! Your tags jar is a great one and I think I might have to case that! But your card is so amazing and personal! I love the idea of a memory box. How special will that be. Also I love the idea of a jar of premade round sentiments. I will have to get right on that one. Thank you for sharing. God bless! super Cute Projects. Thanks for the inspiration. Anyone would love to receive that cute box or the card. Great ideas that just take a little time to make. Wow, thanks for sharing such versitile ways to use the stamps. All you projects are great. I LOVE your box. It is beautiful! What a beautiful little box. The card is striking also. 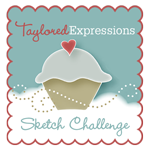 The jar of sentiments is a great idea for yourself or a fellow stamper. There are so many different stamps! love your memory box. esp the extras you put on the corners of the box. cute. Love how you used JR stamps for these projects. Wonderful! You've been busy with very neat projects and great ideas. Thanks for sharing. Great projects. Love the tag jar. Such a pretty memory box! Great idea, I have incorporated jars for storage in my craft room and this will fancy them up. I've been looking for a way to store my extra embellishments I make and this is so much cuter than a ziploc bag! Your box is beautiful, and the colors are great! I also love the tags - nice idea. Oh my goodness, look at all those projects!! So beautiful! Wow! Fabulous Projects! Your box is just genius! They are all lovely! Thanks for the fantastic inspiration! These projects are great. I really like the memory box. I love the memory box. It's so hard when friends move away. Im just into the hop and I have several projects planned already. Fabulous projects! I love the tags - great idea!!! Great projects! I love your style. Thanks for the inspiration. What great projects. They are all lovely. Beautiful box! Loved the card and tags. Beautiful! Lucky little girl to receive that memory box. I'm sure she will treasure it. Great projects. I think I need to work on the tag project. What a great idea. Love all your work. Beautiful projects! That box is to die for and the card and tags are SOOOOO cute! Very nice. I love the colors Your tags are lovely and a wonderful idea. What amazing projects! Thanks for your creativeness. Oh my, your box is just gorgeous. Love the sentiment and image on the front and the colors you chose. Very nice! I especially like the idea of making medallions with sentiments and keeping them in a jar until ready to use. 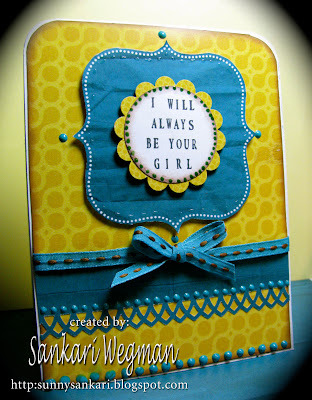 A great way to make cards... just pick a background and glue on the sentiment. Beautiful work! 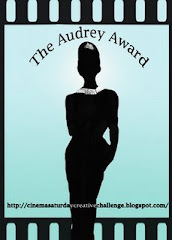 These are lovely ideas, thanks so much for sharing , your blog is awesome!!! I am loving all your little projects...these stamps truly do make everything personal...loved the tags and the memory box was too precious...I will have to make one of these for my granddaughter! love all your ideas! great use of color and fonts! Fabulous projects, Sankari -- love your sentiment jar idea! Thanks for the ideas. The box is just beautiful. Wow, the box is gorgeous!!! I love all the little tags you did too, so cute! Great projects! Love the tags. Sankari, your projects are all gorgeous and brilliantly creative!!! Love all the eye candy!!! Beautiful memory box! Loved the colors. You do lovely work. The memory box is just beautiful. Graet projcts! I love the idea of the tag jar! Love the box. The jar is such a great idea. I love the little box! That is such as sweet and thoughtful gift. What thoughtful gifts, Sankari! 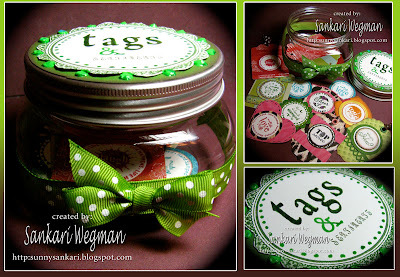 I love the personalization of your box and card...and love that tag jar! You are an inspiration, indeed! Those are some great ideas. I love the personalized memory box. The tag jar was a really good idea also. Thanks for sharing. Love the colors on the box, great job. Love the colors on the box, great job! I loved your memory box what a great idea and how cute! I also love the jar to hold premade tags very useful idea. Thanks for sharing. Love all the tags. Your packages will be beautiful. Beautiful projects! I especially loved the idea and presentation of the sentiment jar! Three wonderful ideas. I especially like the idea of the jar of tags. So convenient to have them all done and ready to go. Oh, Sankari - those are absolulely amazing. I love the colors !!! The memory box is just beautiful. amazing projects love the colors on the card. and the gift set is just great. I love the tag idea! Having those available ahead of time would be great! Thanks for the ideas. Love all of your projects, but the box can be used for so many things! The grandkids will appreciate these for Christmas, but I also want to make some for recipe boxes for me & my kids to match our kitchens. I like the idea of the premade tags and sentiments. I tnkin I will try something like that. Thanks for the inspiration! Wow, your projects are beautiful. The memory box is my favorite. I like the idea of the premade tags. I think I will try something like that! Thanks for the inspiration! What a great idea to have a collection of all those various tags ready to go....and I love them all. All 3 of you ideas were wonderful but I love the ready made tag one.! Great Job. What a special gift for a special friend. Your ideas help me make better use of my Just Rite stamps! Wow, all of these projects are just so perfect!! oh my gosh....these projets are amazing! Love that tag idea! JustRite is the perfect size for tags. Thanks for the ideas. I love what you did with your box - and the tags are so adorable. Can't wait to make some myself! These are great. I need a jar of tags too! THUD! That is me on the floor...you are one talented chick! I love you and treasure our friendship! Beautiful projects. I love the box. Oooo! Love 'em all! Especially the tags - very handy! Thanks for sharing! I love the Tags and sentiment jars. Love JustRite. Love those stamps Sankari and all the stuff you made with them! Fab job! Each project is better than the last. I love your creativity. Love, love, love these projects. Super cute ideas. Who wouldn't love getting this? Great projects Sankari! I just can't choose one of them as my favorite - I love them all! Wonderful ideas Sankari! Those tags are genius! Great us of fonts. 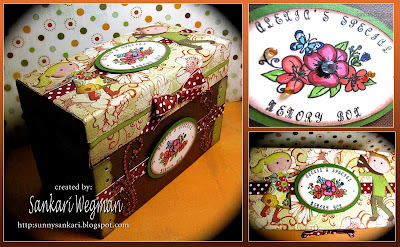 I love that box and that little jar of tags....gorgeous - I could do with having a jar like that!! Great project thanks for sharing! Love the sentiment jar. I need one of those. Waiting for my Justright stamps to come in the mail. WOW! Everyone of your creations are just plain wonderful! LOVE the creativity you showed using the stamps. Cute personalized projects. I love all the new things JR is doing. Darling stuff! TFS! The box you did for Memopies is my fave, but I love the colors on the card. gotta go get some stampin' done and I will use my JR stamps. Thanks for showing the special occasions font. It's so helpful to see these "in action," so to speak. This box is a wonderful gift to your son's friend. 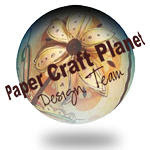 These stamps are so versatile your project showcase them beautifully. Super projects! Thanks for the inspiration. I want it all now! Stunning. Loved each and every one of your projects. I just fell off my seat with that box of yours and the texture on the girl card, and the ........ LOVE how your mind works! all the projects are great. I love what you have done with the stamps, I especially love the way you have stamped a number of tags and sentiments and store them for future use, this would definately save time. Beautiful projects. I love them all!! What wonderful projects. I especially love the treasure box. I love the tags and sentiments. Beautiful work and great blog!! wonderful idea to stamp ahead the "toppers"
Great ideas! Love the box. Thanks for sharing. 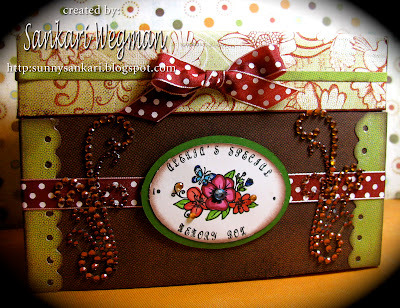 Dottie K.
The memory Box is beaitiful!!! lots of fun ideas here! I really love your projects. My fav would have to be the box. Wow -- great projects -- really shows the versatility of JR's!!! I love all of your projects but the box is my favourite. Love your projects. My favorite are your tags. What a great idea. What clever ideas. Thanks for sharing these fun projects. Your projects are absolutely adorable! The memory box is my favorite and would be a treasure to anyone who received it. Please use the email address below my name. Thanks. What a bunch of loveliness you have created!! love all you projects, especially the jar. Great job. I like the Times Roman Font the best so far. But I really liked your jar with all the tags too. Great job. Great projects. The memory box is such a thoughtful gift for your friend. Love the colors used in the card. I love what you did with all of the projects, but the jar of tags really caught my eye. They are wonderful. Beautiful projects! I especially like the memory box..your friend is a lucky girl! Fabulous projects Sankari! You always come up with the greatest! Love that box! TFS! What great ideas! You know how to use JustRite just right! Sankari, sorry to say but this is the first time I have been on your site and have I ever been missing some beautiful projects--you are really good. I really like all of your things, but the Sentiment Jar is my favorite, such a smart time saving thing to have around. A very cool lot of projects. Awesome projects and I love the box! I am glad for this blog. I was able to see all the nice work you have been doing for some time. I will definately be back. Great ideas and I love thie gift for your son's friend! How thoughtful. What an amazing collection of projects- you are so talented! Thanks for sharing! Thanks for the great ideas. These projects are awesome!!! Love all the projects, especially the "Tag" jar! What a special gift for your friends with the memory box! All the variety with the tags-wonderful! JUST RITE STAMPS are the best! Love the labels on the top of the jars. What beautiful projects you have created. I especially like Alexia'a memory box. I know she will cherish that for years to come. Loved your projects! Makes me want to add a lot of stamps to my collection! Alexia's memory box is adorable! 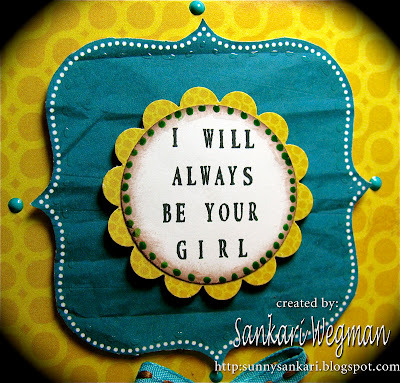 Great card for your husband, and the little tags are so cute. Your projects really show us the versatility of the JR stampers and fonts. Love the tags and the memory box. WOW! You are a busy girl! Your work is wonderful! I love your box and those great tags! Thanks! Such nice projects. I would love some Just Rites. Love the projects! A great tag idea. Great projects. Love the box, what a nice gift. Thanks for the ideas. HI Mickey - thanks for your sweet words! I couldn't figure out how to find your email address - so I am writing here hoping that you will see it! What a beautiful box. Love it all. These are all great projects. The box is just too pretty. The jar of sentiments is really neat. The wheels are turning! The tags were fun - and what a great idea to make up so many ~ now they are ready to use! And so colorful. Love the tags! Thanks for everything! All 3 projects are great. My favorite is #3 with all the little tags in the jar.